Tap Skills in the hamburger menu, then search "SMAlux"(Smartlife). Select "SMAlux"(Smartlife) and tap Enable to enable the Smart Life Skill. This light bulb can be single controlled or you can create a group for all your smart devices and control them all in one command (up to 20 bulbs in group). Every smart light allows multiple access and control, you can let your family or friends register on smart app, share the device with them. 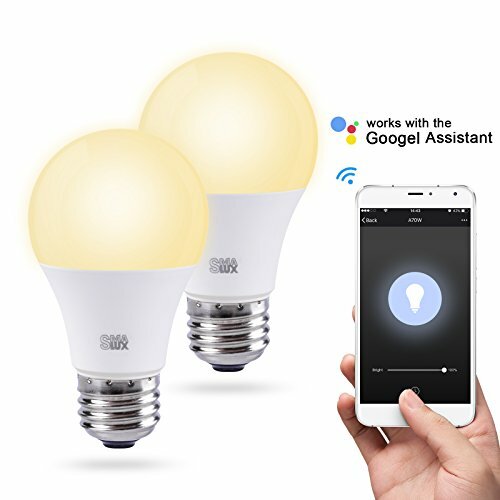 The smart bulb works with Amazon Alexa and Google Home Assistant, You can turn on/off the bulb, adjust the brightness via your voice without leaving your bed. And you can control your bulb no matter where you are, turn on/off your home’s light bulb remotely even you're in office. Once it is set, the sleep timer will automatically turn off the light after you go to sleep. You don't need to turn off the bulb before you go to sleep. Smalux illuminates with the brightness of a 75W-equivalent incandescent, but only uses 9W of power to do so, saving you over 80% on your lighting costs. 【Wifi Remote Control】: Control your light bulb no matter where you are. Turn it on/off without leaving your bed or before going back home. Suitable for home, store, super market, office, hotel. Individually control or group control is available. 【Schedule feature 】: Create customized schedules with the smart bulb to turn your lights on /off at specific time. Wake up in the morning to your favorite colors, switch them on before you come home .Never worry come home with dark house! Improve your home security when you are not home by scheduling your lights to turn on and off, giving the appearance that you are at home. 【Group Control】: Individually control or group control is available. You can set up a group (up to 20 bulbs in group), you can pull family members in, everyone in the group can control these light bulbs. It allows you to control a single bulb, or group bulbs and control them together. If you have any questions about this product by Smalux, contact us by completing and submitting the form below. If you are looking for a specif part number, please include it with your message.